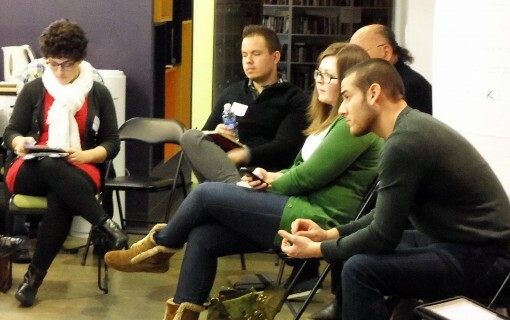 Attendees at the February 10 Book^2 Camp in New York listen to proposals for self-directed debate sessions. But as exercises go, there’s a potentially worthy workout in the annual Sunday-afternoon Book^2 Camp event that precedes the O’Reilly Media Tools of Change for Publishing Conference (TOC / #TOCcon) in New York. If only provisions were made to capture what goes on in these discussions. You pronounce “Book^2” as “Book Squared.” And between that and the “Camp” camp of the name (this is pretty wussy “camping,” hot and cold running everything), the event this weekend warranted more serious consideration than its branding suggests. 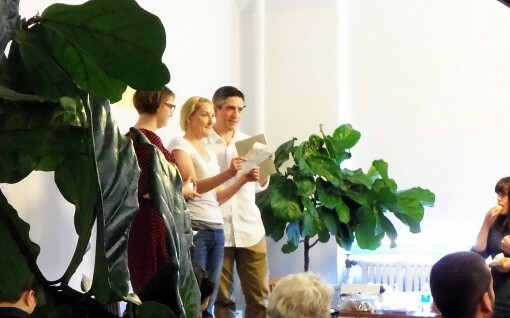 We’re indebted to Chris Kubica and Ami Grecko for spearheading Book^2 Camp each year. In a particularly good-looking move, the mighty Tools of Change program, itself, provides top-level sponsorship. 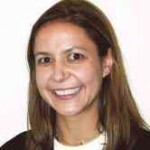 TOC Co-Chair Kat Meyer is generously engaged in the effort, personally. From left, Book^2 Camp counselors-atop-furniture Ami Grecko, Kat Meyer, and Chris Kubica call for debate topics. Everyone on hand is invited to propose a topic for discussion. That’s the “un” in this “unconference.” Rather than having organizers program the afternoon, participants both pitch and then debate the themes that interest them. 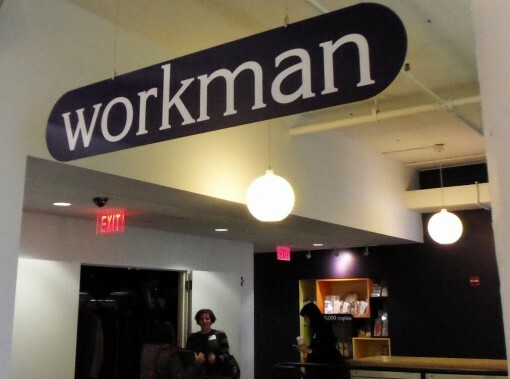 Four 45-minute time periods divide the day between 1 p.m. and 5 p.m.
Workman Publishing in Manhattan sponsored the 2013 Book^2 Camp with multiple discussion spaces. 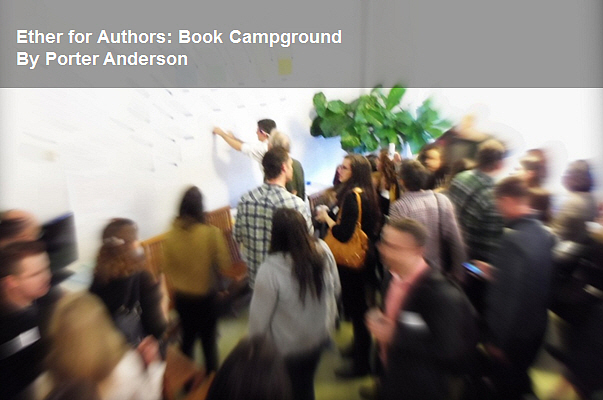 What’s striking about this event—another “un” factor—is that it’s attended by many of the actual doers of publishing. It’s not a suits-and-slogans affair. Many of these folks are the professionals at middle-management and daily-execution levels, from small outfits to the Big Six. These talks are among the workers, in other words, and they’re sometimes surprisingly candid. In one session Sunday, for instance, I heard an exchange between highly experienced staffers from Amazon and Random House. They understood each other’s problems well, although barriers to in-house innovation meant different things to them. 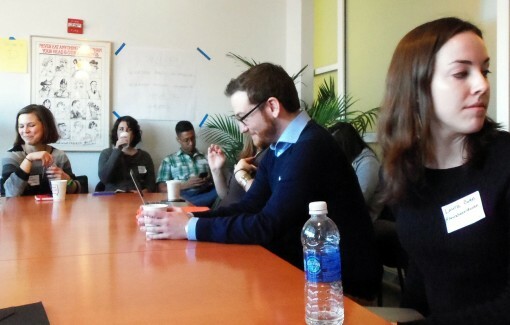 This year, Joe Wikert, O’Reilly Media General Manager and Publisher (and TOC Co-Chair with Meyer) spent the afternoon at Book Camp, creating perhaps the most satisfying link yet between the two events—digital publishing’s most tech-aggressive formal conference and Book Camp’s low-key informality. 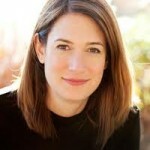 GigaOM's Laura Hazard Owen proposed and led a session at Book^2 Camp on discoverability. “It makes a ton of sense to put the (work) where the eyeballs of the community already are,” Wikert told a packed debate on online discoverability proposed by GigaOM’s Laura Hazard Owen. By getting a community into place, Wikert said, the reader-mojo an author needs is already in place for a project’s launch. Discoverability is a dilemma that would come up all afternoon in various contexts. One of the most cogent observations on this topic came from Guy Gonzalez, who said the challenge may not be so much reader-discovery of books as it is major publishers’ trouble in finding those readers. Valobox’s Oliver Brooks stressed his company’s belief in “trying to make the book web content,” exposing entire texts to discovery by search. Another session, this one proposed by Anne Kostick (who led Digital Book World’s Publishing Innovation Awards jury), focused on what she calls “publishing archeology.” It led Barnes & Noble’s Matt Mullin to describe a kind of publication he’d like to see of work, perhaps out of print (pre-digital era) produced in a way that surrounded and explicated it with work of the authors’ major influences. The way a success for one major player becomes something the others try to copy (another theme I heard several times during the afternoon). Book^2 Camp participants listen to points in a late-afternoon discussion. Some sessions in this format take off unexpectedly with lively discussion and useful takeaways. Others never come together as well, occasionally because a group’s viewpoints just seem too disparate to gel. But having the issues come from the participants seems to channel energy into the debate worth recording. If the process of the “unconference” starts with relative informality (bring your own topic), the one area I’d like to see Kubica and Grecko consider for possible rigor is in the chance to capture and analyze some or all of the spirited tone and camaraderie here. Lastly, with TOC’s new Author (R)evolution Day coming on Tuesday—O’Reilly’s first major full-day conference-within-the-conference for authors — it’s worth noting that authors are largely absent from Book^2 Camp. I don’t know that authors’ scarcity at the event is in any way intentional. But surely when the “brightest minds in publishing and technology,” as the site’s copy says, convene next year “to solve what the next incarnation of the book will be,” it will make sense to include some of the people who will write that next incarnation. It’s unlikely at this point that a traditional publisher (or group of publishers) is going to invent a retail platform that will rival Amazon or iTunes. 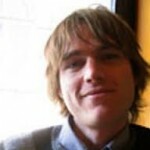 But Chris McVeigh, in an article at TheFutureBook’s blog, hardly is suggesting publishers throw in the towel. That doesn’t mean that publishers shouldn’t aspire towards creating their own destination sites and eventually owning the means of distribution (and their own customer data). On the contrary, that is exactly where I think they should be headed. The key is how to do that? How do publishers define realistic, attainable goals in this space and how do they achieve them? Instead, even as folks at Book^2 Camp were debating discoverability issues on Sunday, this new write was being posted. Simply put, verticals are subject or genre defined categories into which publishers can easily group their titles. Marketing 101 — segmenting your customer base into smaller, more manageable categories increases the targeting and effectiveness of any subsequent marketing campaign. Jeff Bezos did not set out in 1994 to create a bookstore — if you think that you hugely underestimate his ambition and his achievement…Bezos set out to create an online retailer. He used books as a Trojan horse, identifying the supply chain of the publishing industry as the one most ripe for disintermediation. Publishers, instead of setting out a grand vision for building the biggest book related destination site in the world, should set themselves smaller, more attainable goals. Publishers who master these skills [using marketing techniques to leverage big data] will be able to target where the audience already is instead of trying to tell the audience where to go. They will be able to position their websites, communities and social media campaigns in the right place and that is often half the battle. This week is among the most intensive for publishing. Book^2 Camp discussion topics are assigned to available meeting spaces. Author (R)evolution Day, like the rest of the O'Reilly Media Tools of Change events this week, is at the Marriott Marquis on Broadway. Author (R)evolution Day is set at the Marriott Marquis on Broadway in Times Square and runs parallel to a series of Tools of Change workshops, also at the Marriott, on Tuesday. Good news from the O’Reilly Media Tools of Change for Publishing folks producing Tuesday’s (February 12) Author (R)evolution Day (hashtag #ARDay): A live stream is being provided of the entire program, and you can find it, I’m told, on the ARDay page. Watch, free of charge, if you can and join us from afar via live video and, of course, in our tweet-storm from the conference at #ARDay. 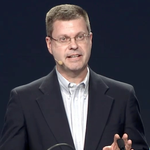 The opening comments come from O’Reilly Media’s Joe Wikert and Kat Meyer and their co-chair from the sponsoring Bookigee and WriterCube, Kristen McLean, at 9 a.m. ET / 1400 GMT. Except for breaks and lunch, we’re in session all day until about 5 p.m. ET / 2200 GMT. Please join us! There has certainly been a lot of social media chatter ABOUT Gillian’s books, although it’s true that for the most part she was not out there participating in or generating the conversation. I noticed that Ms. Flynn’s website is great but not updated often. I could not find a blog, a mailing list, or a Twitter handle. I may have missed them, but it was not obvious. She has a Facebook page with 13,000 people which I assume is updated by someone other than her and only about her events. Clearly in this case, the books are hugely successful without the author’s investment in social media, so do you think an investment of social media/digital marketing is important for an author’s success? I am seeing social media burn-out in authors and second because I realized that two of the top selling authors of 2012 did not invest much time in social media. There is a big difference for fiction vs. nonfiction authors. For nonfiction authors with a specific expertise, being out there in the community that has interest in that expertise will most likely be effective in selling their book. For fiction authors, trying to “sell” their personality may not be as useful for getting someone to read their book for the first time — this isn’t a popularity contest, it’s about the reading experience. I do think readers like to form relationships with authors whose books they love, but that comes AFTER they’ve read the book. So it can be more useful in building and maintaining an audience over time. This week here in New York City, “slush pile” is more immediately likely to refer to an actual pile of dirty-snow slush than to literary proposals that come in over the transom. We still have our regular slush piles to go through; we get queries; we get referrals; we meet writers at conferences. There are plenty of other ways to find good books, and staying on top of the self-pub world is an additional task. 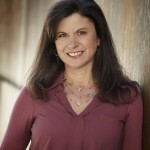 This is Books & Such literary agent Rachelle Gardner in Are Self-Pub Books the New Slush Pile? Her answer: not necessarily. One of her arguments I find most heartening is that the “wisdom” of the masses may not be all it’s cracked up to be when it comes to an agency’s choices of clients and material. The self-publishing approach is basically crowd-sourcing; that is, letting the masses decide what is good. But often the informed and passionate opinion of one person can be even better at identifying something of quality and bringing it to an audience who would otherwise never have found it. 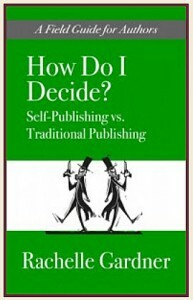 Gardner has recently become something of a new-agent symbol, herself, by self-publishing a book of her own, How Do I Decide: Self-Publishing vs. Traditional Publishing. One might argue that the agent is asking herself her own question: Has she now entered the great e-slush pile? Is she about to get a call from a busily surfing editor who spots her book and wants to offer her a contract? Gardner has more good points that argue against it. A huge self-pub bestseller at $0.99 or $2.99 may not translate into a print bestseller for a publisher at $12.99. Self-pub hits aren’t guaranteed traditional-pub hits. Many agents and editors work in genres that aren’t well-represented in the self-publishing world, so looking in that direction for their next books might not be time well-spent. While some lucky authors have the interest and the aptitude to be entrepreneurial, others simply want to write and aren’t interested in self-publishing. It’s a nicely “graying” read that helps restore the fact that nothing so simplistic as “the self-publishing slush pile” can stand unchallenged for long. Doing book blurbs. I hate blurbs. 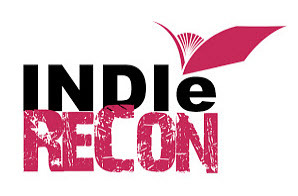 If you have a publishing conference in the offing, do let me know about it via my contact page, and I’ll be happy to consider including it in my site’s listing and in columns as I have the chance. 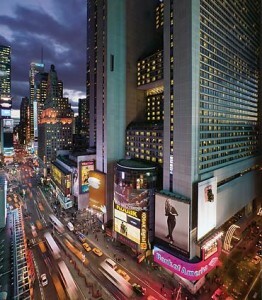 February 12 New York City at the Marriott Marquis New York in Times Square. A first-ever author-dedicated daylong conference from the O’Reilly Media Tools of Change team, led by Joe Wikert, Kat Meyer, and Kristen McLean. Remember that if you can’t follow all the day’s tweets or the live stream from Author (R)evolution Day, you can review the tweets and other ARDay/TOC materials on our Epilogger tracker. 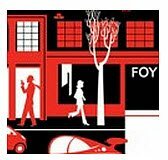 An exclusive bookshop membership club for book lovers #futurefoyles but does it go against the grain of open bookselling? #futurefoyles Sleep cubicles for power naps? May 2-5 Oxford, Mississippi Oxford Creative Nonfiction Writers Conference & Workshops Susan Cushman follows her Memphis Creative Nonfiction confab with this year’s gathering at the shrine. Among faculty members: Neil White, Leigh Feldman, Lee Gutkind, Dinty W. Moore, Beth Ann Fennelly, Bob Guccione Jr. and Lee Martin. Pre-conference workshops or just the creature itself, your choice. Lmao RT @charlietheking: The most dangerous and time-wasting words in the corporate lexicon: ‘let’s have a pre-meeting’. May 3-5 Boston The Muse & the Marketplace 2013 is a production of Eve Bridberg’s fast-rising non-profit Grub Street program. Its material tells us that organizers plan more than “110 craft and publishing sessions led by top-notch authors, editors, agents and publicists from around the country. The Manuscript Mart, the very popular and effective one-on-one manuscript reviews with agents and editors, will also span three days. 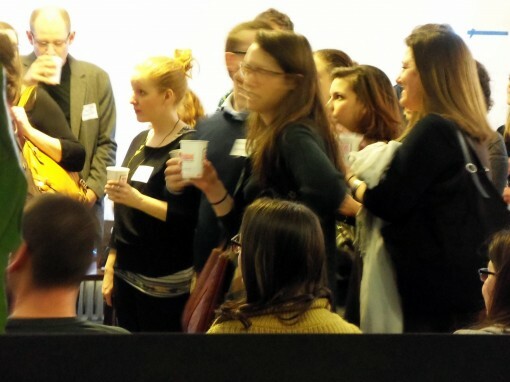 We expect nearly 800 writers and publishing professionals to attend, while maintaining the conference’s wonderfully intimate, ‘grubby’ energy that we love.” Back to Table of Contents Focus is a thing. A substance we can’t see but an actual force nonetheless. Focus is a thing. A substance we can’t see but an actual force nonetheless. Going back to the question we started with — whether we might not want to try to capture, record, analyze some of the outputs from the “ongoing unconference” that is Book^2 Camp — I’m struck by a dire parallel. Of all the 3/11 archives, the Japan Disaster Archive most expands, or even violates, the accepted bounds of the archive. For a start, it stores almost nothing. Instead, it is networked: nearly all of its over 1 million items—documents, websites, tweets, images, audio, video—are not actually held on Harvard’s servers. They come instead from a federation of “content partners” like Yahoo! Japan and the Internet Archive. This is from Kyle Parry’s Notes from the Participatory Digital Archives Conference for Issue No. 5 of Erin Kissane’s outstanding Contents Magazine. The archive is also “participatory.” It provides its users with the means to annotate and geo-locate items and enables them to build “collections.” These collections can either stand on their own or form the basis for multimedia interactive narratives. To hear us moan about the industry! the industry! you’d think we were caught in an experience to warrant “Japan’s 2011 disasters,” as they’re called. We, of course, have nothing to compare to such a horror as the quake, tsunami, reactor failures and associated ordeals, nothing. 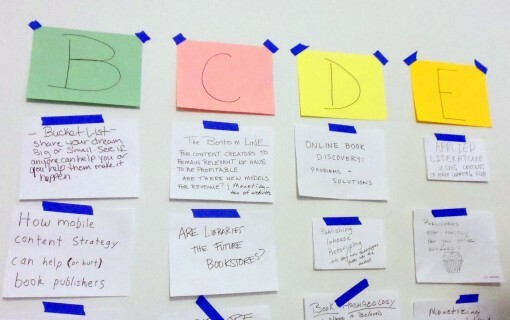 Conferences on disaster and participatory archiving are by no means common — one unconnected event called “Archiving Catastrophe” took place last year in New York. At their core lies a new fact of life: disasters like those of March 2011 now necessarily involve the automatic production of vast digital records. From the textual to the audiovisual to the quantitative, these records flow through recordable live feeds in near-real time; those accessible on the web are continually and automatically indexed; and newly created and digitized documents continue to appear well after the events have reached their apparent end. Front-row as I was, I still had trouble collecting this kaleidoscope of themes into any meaningful question—aside from briefly pointing to the challenges of audiovisual storytelling. Over the weekend that followed, however, some of the most striking themes crystallized. And so I think we sometimes feel in our current — and not-a-all-over — upheaval in the business. We watch even Author (R)evolution Day approach with some trepidation: are we attacking the right points for authors struggling to take on the new curtmantle of entrepreneurial leadership in a staggered business? The impulse to make archives may not be ours alone; we build on the spectral prototypes machines already assemble. We’re all reaching for it, trying to bend tools to the moment’s need of reflection and the era’s demand for great and serious care in what we do, what we say, how we choose our next moves. Here’s to getting some things right. We’re going to need to do that.